6 Broadcaster Press Save The Date For The 2018 Northern States Beef Conference BROOKINGS, S.D. 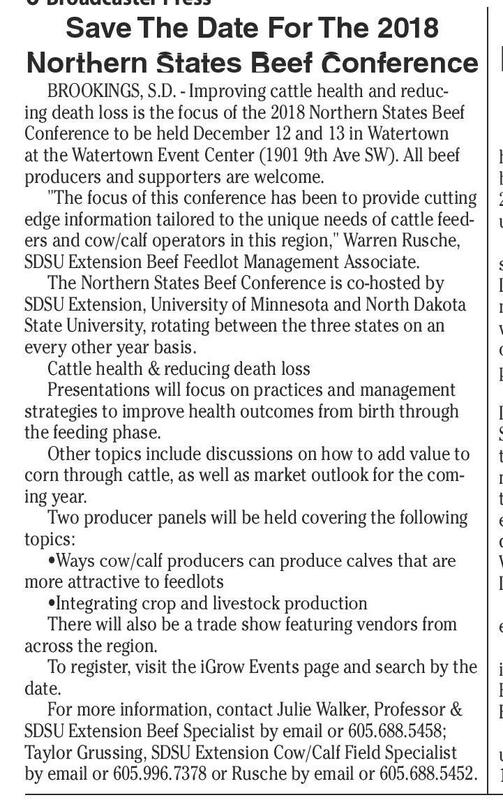 - Improving cattle health and reducing death loss is the focus of the 2018 Northern States Beef Conference to be held December 12 and 13 in Watertown at the Watertown Event Center (1901 9th Ave SW). All beef producers and supporters are welcome. "The focus of this conference has been to provide cutting edge information tailored to the unique needs of cattle feeders and cow/calf operators in this region," Warren Rusche, SDSU Extension Beef Feedlot Management Associate. The Northern States Beef Conference is co-hosted by SDSU Extension, University of Minnesota and North Dakota State University, rotating between the three states on an every other year basis. Cattle health & reducing death loss Presentations will focus on practices and management strategies to improve health outcomes from birth through the feeding phase. Other topics include discussions on how to add value to corn through cattle, as well as market outlook for the coming year. Two producer panels will be held covering the following topics: •Ways cow/calf producers can produce calves that are more attractive to feedlots •Integrating crop and livestock production There will also be a trade show featuring vendors from across the region. To register, visit the iGrow Events page and search by the date. For more information, contact Julie Walker, Professor & SDSU Extension Beef Specialist by email or 605.688.5458; Taylor Grussing, SDSU Extension Cow/Calf Field Specialist by email or 605.996.7378 or Rusche by email or 605.688.5452. 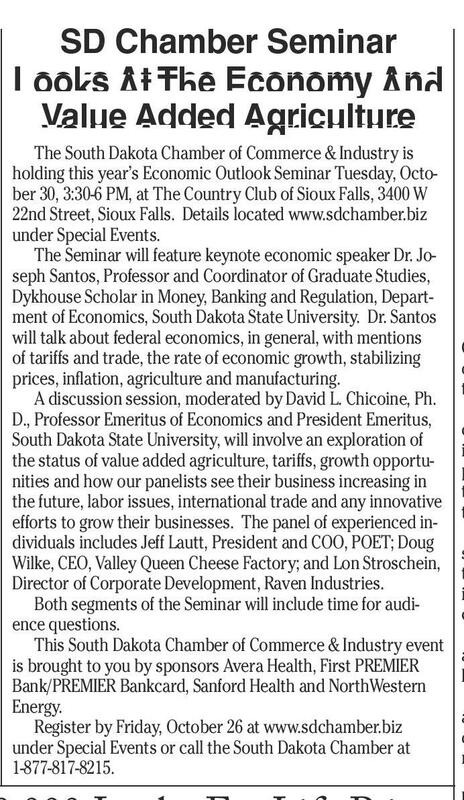 SD Chamber Seminar Looks At The Economy And Value Added Agriculture The South Dakota Chamber of Commerce & Industry is holding this year’s Economic Outlook Seminar Tuesday, October 30, 3:30-6 PM, at The Country Club of Sioux Falls, 3400 W 22nd Street, Sioux Falls. Details located www.sdchamber.biz under Special Events. The Seminar will feature keynote economic speaker Dr. Joseph Santos, Professor and Coordinator of Graduate Studies, Dykhouse Scholar in Money, Banking and Regulation, Department of Economics, South Dakota State University. Dr. Santos will talk about federal economics, in general, with mentions of tariffs and trade, the rate of economic growth, stabilizing prices, inflation, agriculture and manufacturing. A discussion session, moderated by David L. Chicoine, Ph. D., Professor Emeritus of Economics and President Emeritus, South Dakota State University, will involve an exploration of the status of value added agriculture, tariffs, growth opportunities and how our panelists see their business increasing in the future, labor issues, international trade and any innovative efforts to grow their businesses. The panel of experienced individuals includes Jeff Lautt, President and COO, POET; Doug Wilke, CEO, Valley Queen Cheese Factory; and Lon Stroschein, Director of Corporate Development, Raven Industries. Both segments of the Seminar will include time for audience questions. This South Dakota Chamber of Commerce & Industry event is brought to you by sponsors Avera Health, First PREMIER Bank/PREMIER Bankcard, Sanford Health and NorthWestern Energy. Register by Friday, October 26 at www.sdchamber.biz under Special Events or call the South Dakota Chamber at 1-877-817-8215. October 23, 2018 www.broadcasteronline.com SD National Guard Substance Abuse Program Receives Secretary Of Defense Community Drug Awareness Award RAPID CITY, S.D. - The South Dakota Army National Guard Substance Abuse Program received the Secretary of Defense Community Drug Awareness Award at the Pentagon's Hall of Heroes, in Arlington, Va., Oct. 18. The award, established in 1990 in an effort to promote community drug awareness efforts in the DoD community, is presented annually to the best drug demand reduction program for the previous fiscal year within each service, the National Guard, the defense agencies and field activities. While the SDARNG SAP target audience is military service members, it has expanded to a diverse population of youth and adults throughout the state through its involvement with military families, military youth and community coalitions. Program staff is involved with all youth K-12 in Character Counts initiatives, Students Against Destructive Decisions and Red Ribbon Week activities. Support is provided to adults through town hall events and coalition partnerships. Engaging with the elderly occurs during Prescription Drug Take Back events in communities across South Dakota. "Receiving this award is significant to the South Dakota Army National Guard Substance Abuse Program because it shows how important it is that to truly combat the substance issues in your area it takes a community," winning ticket was sold in Redfield. Whitley hurried to his said Kristi Palmer, alcohol and drug control officer with phone to open the Lottery App to see if it was his lucky day. the SDARNG's SAP. "This award shows the collaboration Shock and extreme happiness came over him as he com- with various community coalitions and community-based pared his numbers on the ticket to the winning numbers organizations is what it takes to create environmental displayed on the app. Whitley noted that he will use his change in the area of substance abuse." prize money to provide for his wife and their nine children. Award criteria included: maximizing the use of departIf there happens to be any left after that he said, “Invest and ment demand reduction resources to effectively reach save the rest.” the targeted audience; participation in Red Ribbon Week Whitley will continue to play the lotto games daily but observances; and program impact and achievements. revealed that his favorite scratch game is Trucks and Bucks "It's clear this program has implemented many activiand hopes to be a winner of a new truck. His advice to ties that help keep our Soldiers and young children drug other players is, “You can’t win if you don’t play. “ and alcohol free," Palmer said. "Although awards give Lucky for Life drawings are Monday and Thursday. Whit- some meaning for our efforts with the Soldiers and youth, ley is the second South Dakotan to win the game’s second the lasting award comes from the smile on the faces of prize since sales began June 4, 2017. the youth, showing a Soldier that what they do has made For more information on the game, visit https://lottery. a difference." sd.gov/games/lottogames/luckyforlife Redfield Man Claims $390,000 Lucky For Life Prize PIERRE, S.D. — Christopher Whitley’s close proximity to the Appels Quick Shop in Redfield proved to be fruitful as he claimed the Lucky for Life lotto game’s second prize. Whitley claimed the game’s second prize of $390,000 Wednesday in Pierre. He has lived in Redfield his entire life and works across the street from Appels Quick Stop, which is where he purchased this winning ticket. Chris matched all five winning numbers and was just the Lucky Ball away from garnering the game’s top prize. Chris had the options of the $390,000 cash prize or $25,000 a year for the rest of his life. Although Whitley’s daily routine includes buying a ticket for that each night’s lotto game, Oct. 4 was a life-changing day. He noted that he jokingly told an employee at Appels Quick Stop that, “The unluckiest guy on the planet is buying a Lucky for Life ticket.” Whitley’s self-given title as the unluckiest man on the planet quickly changed when his cousin revealed that a Post-Frame Building Contractor Needed Call 1-605-949-1382 8am – 8pm Monday – Saturday 1360 Income Opportunity 1360 CLASS A TRUCK DRIVER. North Central region. Could earn over $70,000. No touch freight. Good benefits. All mile paid. Nice equipment. Experience needed. Call 507-4379905. Apply on-line WWW.MCFGTL.COM (MCN) 1330 ? Farm and Ranch ? 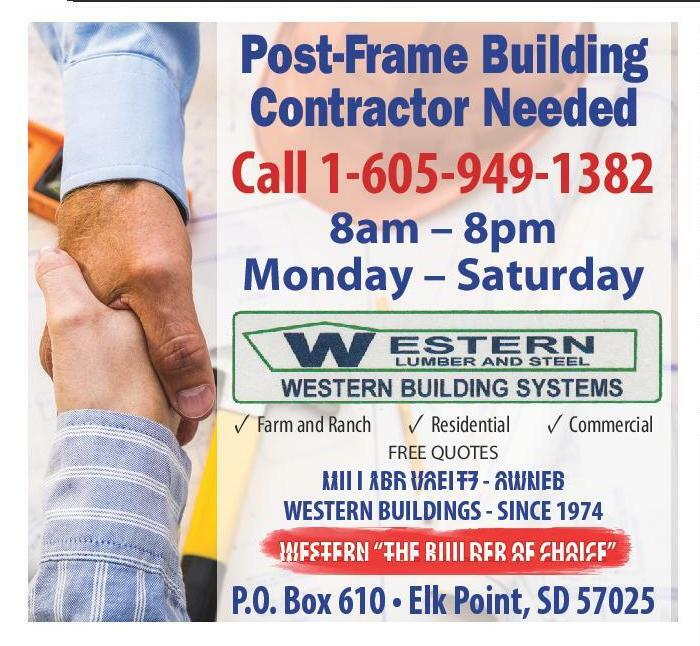 Residential FREE QUOTES Manager Trainee MILLARD VOELTZ - OWNER WESTERN BUILDINGS - SINCE 1974 WESTERN “THE BUILDER OF CHOICE” P.O. 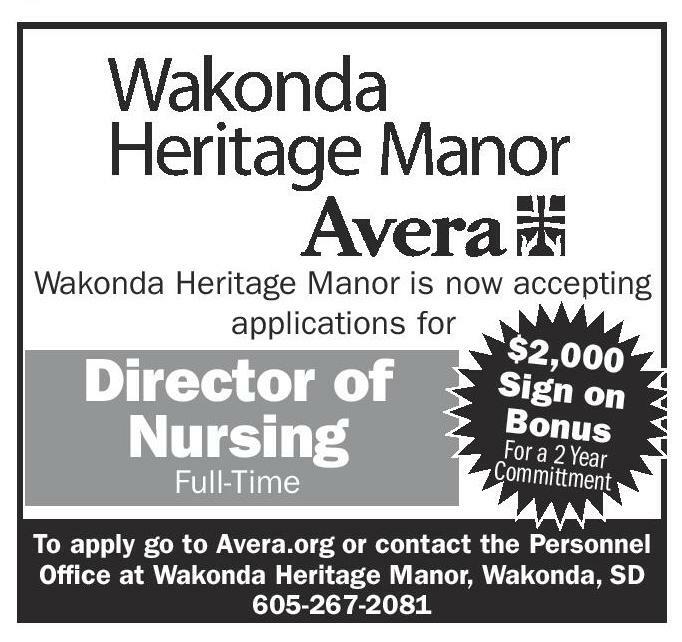 Box 610 • Elk Point, SD 57025 Wakonda Heritage Manor is now accepting applications for $2,000 Sign on Bonus Director of Nursing Great benefits and earning potential. Career opportunities available upon completion of training program. Bachelor’s degree in a business field preferred, but not required. Must be open to relocation. Add’l $3.00 per hour for weekend hours. 3210 Broadway Ave Yankton SD, 57078 To apply go to Avera.org or contact the Personnel Office at Wakonda Heritage Manor, Wakonda, SD 605-267-2081 HELP WANTED ASSEMBLERS – 2ND OR 3RD SHIFT: Mechanically inclined assembler with 1 year related work experience. Blueprint reading experience a plus. 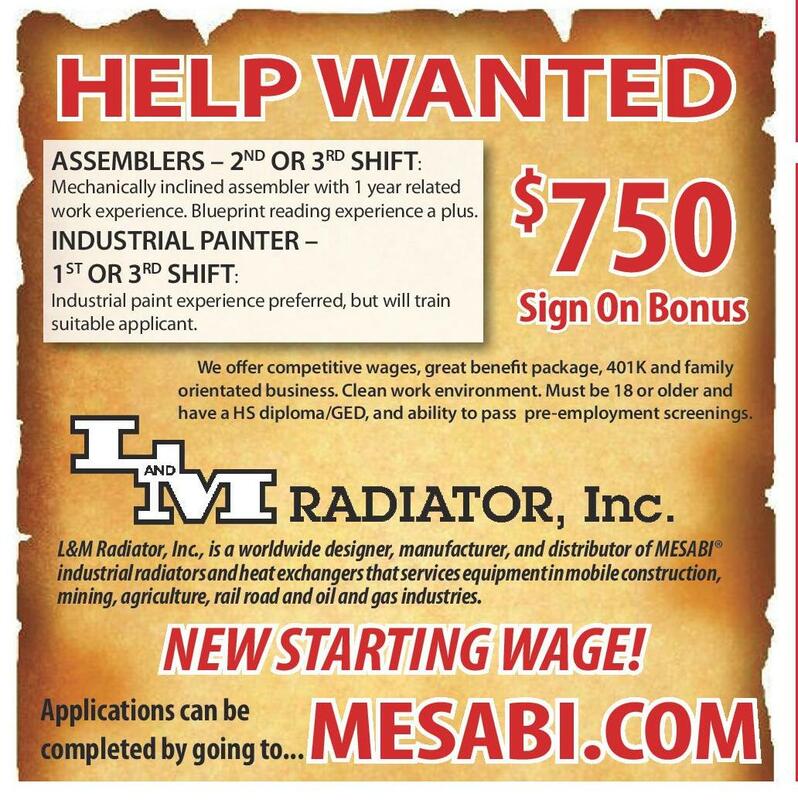 INDUSTRIAL PAINTER – 1ST OR 3RD SHIFT: Industrial paint experience preferred, but will train suitable applicant. 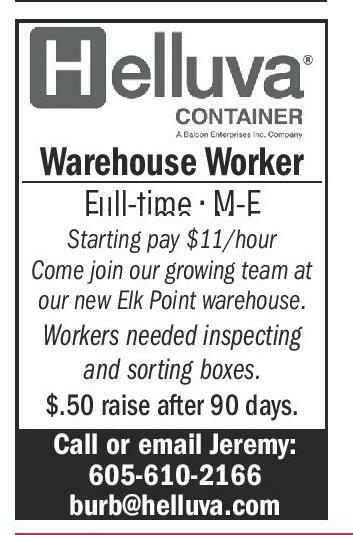 Warehouse Worker Full-time • M-F Starting pay $11/hour Come join our growing team at our new Elk Point warehouse. Workers needed inspecting and sorting boxes. $.50 raise after 90 days. Call or email Jeremy: 605-610-2166 burb@helluva.com 1335 Other Employment Open pOsitiOns: • Building Automation System Specialist • Facility Worker (Custodial) - Multiple Shifts Available • Plumber • Building Maintenance Worker For complete detailed descriptions and to apply, go to http://yourfuture.sdbor.edu EEO/AA 750 $ Sign On Bonus We offer competitive wages, great benefit package, 401K and family orientated business. Clean work environment. Must be 18 or older and have a HS diploma/GED, and ability to pass pre-employment screenings. L&M Radiator, Inc., is a worldwide designer, manufacturer, and distributor of MESABI® industrial radiators and heat exchangers that services equipment in mobile construction, mining, agriculture, rail road and oil and gas industries. NEW STARTING WAGE! Applications can be completed by going to... Other Employment Apply in person at: For a 2 Year Committment Full-Time Income Opportunity NEW AUTHORS WANTED! Page Publishing will help you self-publish your own book. FREE author submission kit! Limited offer! Why wait? Call now: 855-623-8796 (MCN) Professional Employment 1335 ? Commercial Be Careful Grazing The Green This Fall MESABI.COM The Sanford School of Medicine in Vermillion, SD seeks a dynamic, knowledgeable, communication focused, organized and detail orientated individual to serve as the Human Resources Program Assistant to the Division of Basic Biomedical Sciences (BBS). This is a full time, benefit eligible position assisting with BBS Human Resource needs. 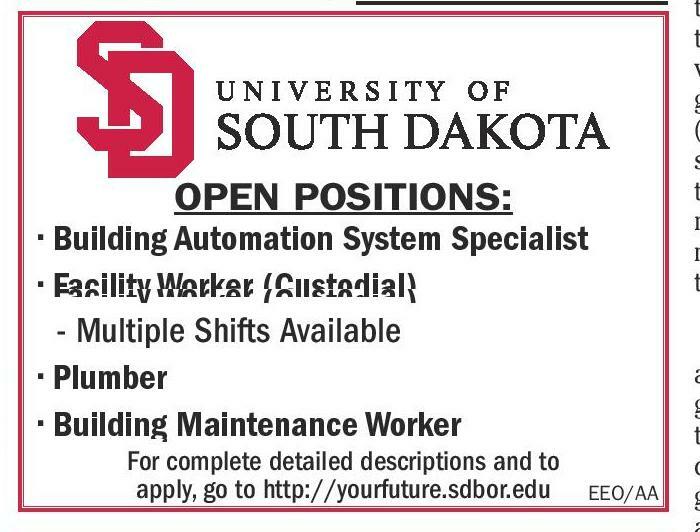 For additional information or to apply visit https://yourfuture.sdbor.edu. Application materials must include a cover letter which addresses how the candidate’s experience matches the position requirements and a resume. 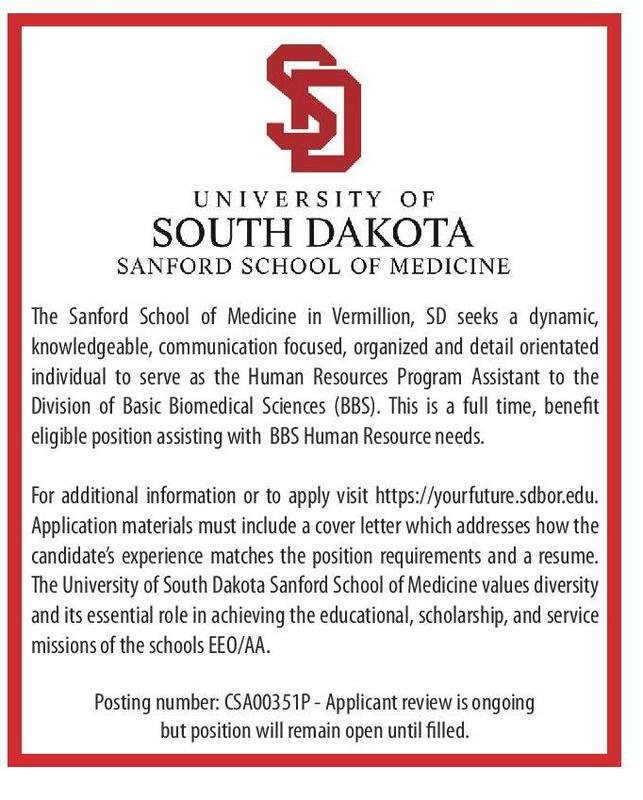 The University of South Dakota Sanford School of Medicine values diversity and its essential role in achieving the educational, scholarship, and service missions of the schools EEO/AA. Posting number: CSA00351P - Applicant review is ongoing but position will remain open until filled. BROOKINGS, S.D. - This fall, South Dakota livestock producers need to be careful when grazing the fall green up of cool season grasses. "Some areas of South Dakota have been blessed with plenty of precipitation this year, making it tempting to heavily graze cool season grasses. But, extreme diligence must be taken not to overgraze during the fall green up of cool season grasses," said Sean Kelly, SDSU Extension Range Management Field Specialist. Kelly explained that during the fall green up, cool season grasses are storing their energy reserves to ensure health through the dormant season and vigor next spring when the growing season starts again (Figure 2). Whereas, warm season grasses grow later in the season during the summer and late summer and do not get another green up in the fall of the year. Leave 6 inches "They grow in the spring and early summer and then get another growth spurt in the fall," Kelly said. "Tremendous damage to cool season grasses can happen if they are overgrazed during the fall green up and they are unable to build those root reserves." He explained that if overgrazed in the fall, cool season plants will have less vigor the following spring and may die out completely during the dormant season. To ensure cool season grasses are not overgrazed, a best management practice is to leave at least 6-inches. "Native cool season grasses should not be grazed shorter than 6 inches in plant height," Kelly said. There are yet other benefits to leaving sufficient plant height into the dormant season. "The soil surface will be protected from erosion and will optimize snow capture during the winter," Kelly said.